Damdam Lake is a popular weekend getaway destination near Delhi, Noida, Faridabad and Gurgaon. 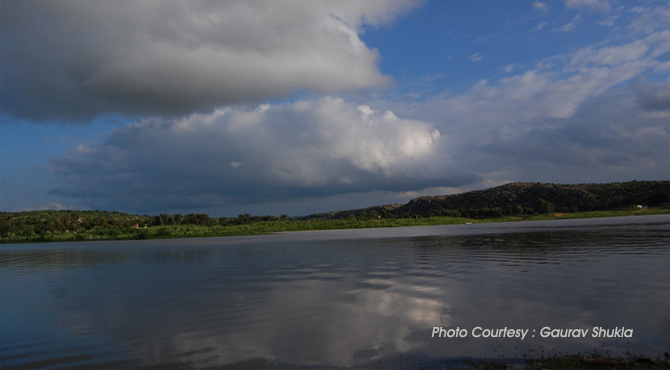 Set in the lap of Aravali hills, the lake is the perfect place to go for boating or a picnic. Covering an area of 3000 acres, Damdam lake is one of the biggest natural lakes in the state of Haryana. It is located about 20 kilometers south of Gurgaon state and is off the Gurgaon-Alwar road. The lake was formed when a stone and earthen dam constructed by the British was commissioned for rain water harvesting in 1947. Surrounded by the Aravali Mountains, the lake, held by an embankment, is fed mainly by monsoon rain. The water level in lake is about 20 feet. During monsoon the water level reaches up to 50 to 60 ft. The ranges gives a scenic atmosphere to the lake and one can enjoy boating in row boats, paddle boats and motor boats. Damdama lake provides ample scope for adventure lovers. There are facilities to enjoy trekking near the Aravalli Hills. Apart from these, other attractions here are hot air ballooning, para Sailing, kayaking, cycling, angling, rowing, fishing and nature walks. Best time to visit the lake is from October to March , late summers and monsoons. Damdama lake is a natural home for birds and more than 190 species of birds, migratory as well as local, visit here during winter season i.e from November to March. Some of the major birds seen here are water fowl, cranes, cormorants, terns, egrets, kingfishers etc. Along the lake side, there are several resorts like Botanix Nature resort, Dream Island Resort , Waterbank Island Resort ,Sans Eco Adventure Resort and and one can enjoy day trip or overnight packages here with family or corporates groups. These resorts has many features to attract the tourist like restaurant, bar, motel wing, conference hall, hovercraft, lawns and camping site. Saras Tourist Complex, run by Haryana Tourism Corporation Limited is located on the bank of Damdama Lake. There are around 15 cottages built in the design of traditional huts and each of these cottages has a separate balcony facing the lake. Tourist can choose any of the cottage depending on their budget and taste. Situated in the foothills of Aravalli hills, it is famous for its natural hot springs. Located on the main Gurgaon-Alwar road, the water here is strongly sulphurous. According to a legend, one of the pandav, Arjun, dug this well when he was thirsty. Sohna is very close to Dream Island Resort at Damdama Lake. An ancient Shiva temple is located in Sohna and was built by the Raja of Bharatpur/Gwalior. A fair called Gangasnan is organised every year on the occasion of Shiv Chaudas and Shivratri. During this time, the temple thronged by lakhs of devotees from all across the region. There is a ritual held at this temple, that the residents of Sohna offer their special prayers to Lord Shiva and Maa Bhagwati for the new born babies and newly married couples. It is located at around 8 km from South Delhi. This complex is an ideal picnic spot which was constructed by Surajpal Tomar. Close to the complex is a fresh water lake, named Siddha Kund, which is believed to have medicinal properties. The Surajkund Crafts Mela is India's one of the most significant craft melas held every year in the month of February, from 1st to 15th. Every year, most of the Indian states and some foreign states including African and Eurasian countries participate in this grand fair. During this fair, various magic shows, folk dances, acrobats and food stalls are also organised.